Another one out this week, this is a lovely slice of vocal, disco house that brings back great memories of feel-good house music from passionate producers who cared about the end product. No shitey urban mash-ups here! We’re reminded of tracks like Modjo’s ‘Lady’ and Eclipse’s ‘Makes Me Love You’ with this one, which is a pretty strong endorsement in our eyes (and ears!). 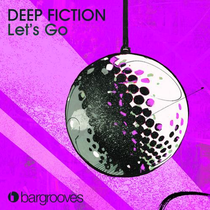 Deep Fiction (also known as Filthy Fiction) is Jeevan Sagoo and Teo Cretella, a West London based production duo who seem to be causing quite a stir with their remixes and productions. The duo have been working the circuit for a few years now, building their names through their own parties and events, which they were resident DJs at. Now, as they develop their sound in the studio, ‘Let’s Go’ is hopefully a good indication of what’s to come. Have a listen below.